During my recent experience with translating Allama Iqbal's poetry, I learned what an arduous task it is to properly translate Urdu poetry into English. I wanted the English translations of my calligraphy of Allama's verses for visitors to the first ever Pakistani Peace & Harmony Art Exhibition during the renowned World Festival in Richmond. I wanted to share the message of Allama to interested Canadians. I suppose the difficulty lies in the fact that there are sometimes several meanings to each word in English. One also needs to be considerate of the contemporary context in which the text is applied, for example, to be mindful of gender neutral words etc. I like to share the following excerpts from a previous news article "Iqbal’s Shikwa and Jawab-e-Shikwa - a contemporary translation," by Saleha Riazabout about the contemporary translation of Allama Iqbal's poems, published in The Express Tribune on May 30th, 2014. "Fans of the great poet Allama Iqbal in London were in store for a rare treat when "Shikwa and Jawaab-e-Shikwa – a contemporary translation" by Professor Muhammad Sharif Baqa was launched on Monday evening. With a symposium chaired by journalist Syed Talat Hussain and a qawwali performance by the Hussain brothers.. The translation of both poems took over a year to complete and effort was put into retaining the poetic rhythm and nuances of the Urdu language. The preface to the book has been written by Professor Katherine Schimmel of Harvard University. The foreword is written by former cricketer turned politician Imran Khan and the introduction is by anthropologist Professor Akbar S Ahmed. Journalist, Syed Talat Hussain said he equated Iqbal’s poetry with the country’s national anthem – something its citizens recite often but don’t really understand. Hussain ended the symposium by saying that we have much to learn from Iqbal. “You can’t change the nation by merely tweeting, there is a world out there that beckons you,” concluded Hussain. In lamenting my glorious past, yet ignoring my bright future? How can I be indifferent to the doleful cries of my nation? O my dear friend, I cannot be tongue-tied like a flower. It is truly my poetic ability that gives me the courage to express my feelings, May I be cursed should I ever complain to God!" Allama's anniversary is on the 9th of November. Now let us all rekindle our own aspirations and amal (actions) while keeping his message and vision in mind for 'all time' and not simply to celebrate another 'day'. It is also worth emphasizing that Imran Khan wrote the forward of the book. 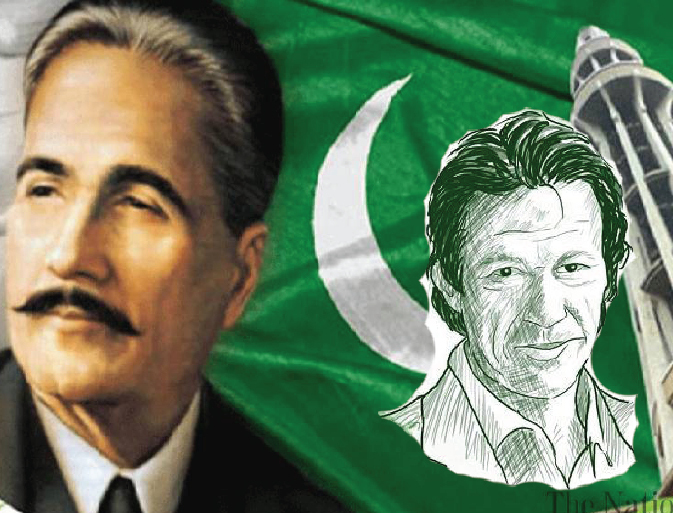 Those who admire and count on Imran Khan to deliver should know that Iqbal's message and vision is a universal and for all time. Pakistan is faced with multifaceted challenges. There is an urgent need to revert to Iqbal’s teachings and philosophy more than ever before. While understandably one is concerned about Pakistan's progress, we as Canadians of Pakistani origin here also need to be better prepared to face some difficult issues and challenges. Our faith and cultural identity is under increased scrutiny and regrettably its portrayal is sometimes biased and erroneous. We ought to promote our unique cultural identity and heritage to shed better light on our comminunty and take part in cross-cultural exchanges that promote diversity and inclusion. Our local community leadership and organizations will be more effective if we start comprehending and practicing Allama Iqbal's vision, mission and message, while engaging in community development work. I remain optimistic and inshAllah, will continue to hope for the best.